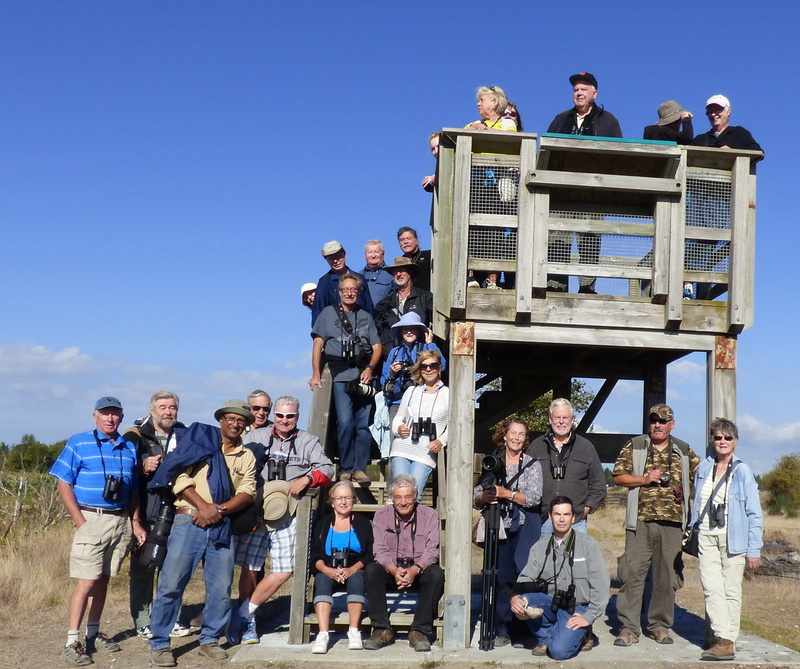 We had another gorgeous Wednesday morning as almost 30 folk (actually 26), including several Newbies, left Cammidge House (CH) at 9:00 a.m. on our quarterly Birds on the Bay (BOTB) outing in Boundary Bay Regional Park. Lots of hi-lites including a Wilson’s Snipe, some Warblers and Shorebirds with the climax a delectable array of goodies prepared by the Delta Nats Ladies at CH. Check out some photo evidence on our DNCB Picasa site. Following introductions and waiver signings, we meandered along the road to the Park toward Centennial Beach. The revitalized pond and surrounding newly planted native species looked really good, but only a few Mallards were in the pond along with one huge invasive Bull Frog. Following some inglorious coaxing, Terry succeeded in taking a Group Photo of the unruly mass. The tide was fairly high as we crossed the sandy beach, and lots of ducks were on the horizon, mostly Mallards and a few American Wigeon. A UBC student studying the micro-organisms in the salty water was the main excitement, although the view across the Bay to snow-covered Mt. Baker is always a treat. I was getting a bit worried as we walked back to the trail as the bird activity was very quiet. It was so quiet, Terry and Marion were taking pictures of grasshoppers, caterpillars, spiders and dead voles. The incessant chatter among new friends eased the sting of not seeing any birds. Along the path a couple of Brewer’s Blackbirds showed up and we finally saw some LBJ’s in the bushes. We identified Yellow-rumped Warblers, House and American Goldfinches, Song & White-crowned Sparrows. Northern Harriers were occasionally gliding over the marsh. We got to the Tower for another Group Photo which Roger was able to take once Gerhard finally arrived following his extended feeding frenzies in the Blackberry bushes. Before continuing along the dike path, we visited Mary’s Bench on the new boardwalk. Very impressive memorial to our Delta Nats godmother. As we passed our Delta Nats bird boxes, the excitement grew as we found some Shorebirds in the mud of the receding tide. Lots of Killdeer and Western Sandpipers were eating the “snot”. Peeps are hard for us Casual Birders to ID; some may have seen Sanderlings, Least or Semi-palmated Sandpipers. A couple of American Pipits were easier to ID along with some Savannah Sparrows. Terry had seen Green-winged Teal here earlier and we know that the Northern Pintail have begun arriving, but none were near the Pump House, only lots of Canada Geese, Glaucous-winged and a few Ring-billed Gulls. Roger and Terry walked further down toward the 12th Street Park entrance in search of a Phalarope (seen earlier but not today). They called us to join them as a Wilson’s Snipe (our Bird of the Day) was feeding calmly in a stream close to the path. Some Yellowlegs were nearby too. Feeling a lot better, but pressed for time, we began our quick walk back to CH via the inland trail. A few Tree Swallows and Cedar Waxwings were around and then the Anna’s Hummingbirds seemed to appear out of nowhere. We reached CH just passed the scheduled 11:30 a.m. schedule where Delta Nat Ladies Eleanor, Rochelle and their guardian Don were waiting. The cheeses, fruits, pastries and Sandra’s famous egg salad sandwiches were quickly devoured by the starving birders. It was another grand BOTB outing. Next Wednesday, Sept. 17 we will meet again at the Peace Arch Park parking lot at 8:00 a.m. (some will start at Petra’s at 7:30 a.m.) to car-pool to Blaine, Drayton Harbour and White Rock Al’s new destination Point Whitehorn Marine Reserve. More info is on our/Ken’s awesome DNS Upcoming Events page. This entry was posted in *DNCB, American Pipit, BBRP, Birds-on-the-Bay, Least Sandpiper, Northern Harrier, Semi-palmated Sandpiper, Wilson's Snipe. Bookmark the permalink.